Using light to target hearing issues may sound farfetched, but it’s not. Scientists say the new field of optogenetics could create cochlear implants that give people more natural hearing abilities. A new field called "optogenetics"
These cochlear implants skip past malfunctioning hair cells in the cochlea, the organ in the inner ear that translates sound, and connect with nearby auditory nerve cells to get signals to the brain. But it’s difficult to target the right nerve cells, which is why sound through these implants is frequently distorted. Optogenetics, which uses light-sensitive proteins to control living cells, could address that problem by offering more precise results through an optical cochlear implant. In a recent study, German bioengineers implanted a protein containing optical fibers in the ears of deaf gerbils. When they sent a pulse of laser light into the gerbils’ ears, the gerbils reacted, showing similar behaviors to gerbils with full hearing. Tobias Moser, the lead author of the study, said, “I had been working on hearing and deafness as a neuroscientist and otolaryngologist for a few years before optogenetics came up. It was clear to me that the cochlear implant is great but suffers from poor spatial control of neural excitation in the cochlea. In fact, most of us would agree that this is the most important bottleneck, resulting in poor frequency resolution in coding and consequently poor speech recognition in background noise. “When optogenetics came up, I considered this the way to go for fundamentally advancing today’s cochlear implant,” he said. Previous studies of optical cochlear implants in mice and rats have shown some promise, but this study’s authors wanted to use a species with a hearing system closer to that of humans. Adult Mongolian gerbils have comparatively large cochleas and can hear low frequencies just like human ears can. The gerbils were first trained through a loudspeaker to jump across a barrier inside a shuttlebox. After they were deafened, they didn’t respond to the loudspeaker. After “hearing” the laser light, the gerbils took an average of two days to relearn the task. According to the study, the gerbils’ neural response to the light looked similar to their original response to sound, and their neurons performed more like normal neurons. The study found that results over several weeks were close to normal hearing behavior, with no long-term damage to the gerbils. These findings are unlikely to bring results for human users anytime soon, however. The scientists used gene therapy to inject the protein in the gerbils’ ears, a procedure that is mostly unavailable for everyday use. And this usage of light requires a lot of energy, more than could be safely stored in a battery, according to the study. But, Moser said, the study shows that cochlear optogenetics could be a good alternative for those with hearing loss, once more in-depth research has been conducted on it. The study’s authors plan to further develop these methods for practical use and Moser said they hope to finish the preclinical work to begin that process in about two years. He added that they’re pleased that colleagues in the field have joined the effort. Lockheed Martin Aculight, for instance, is already working on an infrared laser-based cochlear implant, containing a small strip of lasers rather than electrode pads. The device is still in the testing stages, though. There’s been interest in this topic for years. 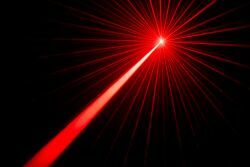 An earlier study found that infrared laser pulses sent through water increase temperature and energy in cells, suggesting that the laser light could be used to help treat problems with the nervous system and other organs as well as with hearing. In the meantime, Moser recommends those with hearing loss continue to use traditional hearing aids or electrical cochlear implants, “as hearing rehabilitation is so critical,” and switching to an optical cochlear implant down the road should still be an option.